It was snowing hard in Edmonds when I pulled into the Kingston ferry line this morning. By the time I reached Port Angeles the skies were clearing. The rangers opened the gate around 10:30 am and about a dozen cars motored up to Hurricane Ridge. 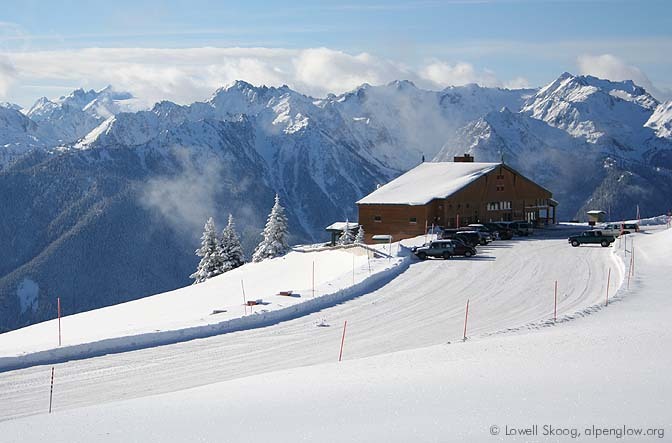 The ski lifts will open later this month. I bumped into Mark D., Jack G. and several other friendly locals and we yoyoed a north facing run not far from the road. The snowpack is still a bit thin and you need to watch for rocks near the ridges. Around 1 p.m. I hustled back to the lodge for an interview with Jack Hughes, the primary reason for this trip. Jack is a legendary ranger (and long-time skier) who retired last year after 50 years of federal service. It was a beautiful day with great snow and friendly people. Awesome picture! I have always liked how rugged the Olympics look. Maybe with a couple more storms the conditions will be up to par.